This is a recommended product by the EngineerSupply Product Team. 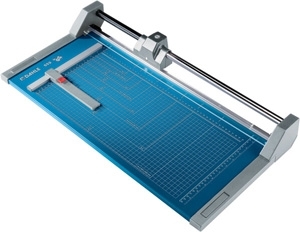 The Dahle 552 model is for professional use. It's considered indispensable and is found in advertising agencies, graphic design and photographic studios all over the world. The Dahle 552 gives a burr-free cut every time as it features a ground, rotating upper blade, ground lower blade and an automatic clamp. The durable table is pre-printed with a grid and can be wall mounted. Table Size: 25-3/4" x 12-1/2"
Dahle North America, Inc. offers a lifetime warranty against defects in manufacturing, materials and assembly (excludes cutting blades and clamp).